Vedic astrology: Custom made, Ayurvedic and Jyotish jewelry. Yes, all of our astrological talismans and jewelry you see on the site have been custom made. 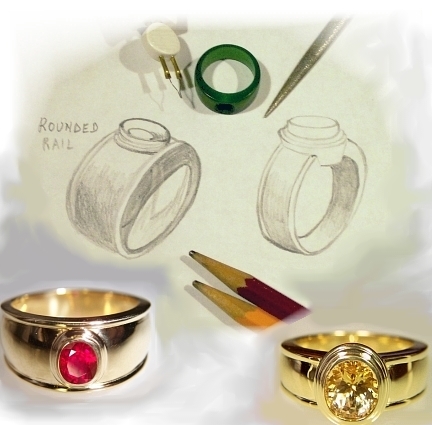 With the exception of diamond e-rings, shown here, the rest of the settings are designed & created by us. We offer custom-made jewelry for all the stones you see on the site. As our prices are the most competitive for the quality offered, both in terms of colored stones and custom-made jewelry, we do not make pieces with other people stones. This creation process usually sparks during our overseas, buying trips, when we buy or deal a particular stone or group of stones. When Rodolfo chooses a stone, he already envision the finished piece. It is a furtive glimpse, a creative vision. Be it a square cushion or trillion, Ceylon sapphire, an oval, Colombian emerald or a Mediterranean coral cabochon, it is a this point that something starts to get created. Technically, however, the custom piece itself start back in our office with a custom design, after the customer has chosen a gem and laid out its requisites. Factors like male or female taste, size, shape and depth of the stone, finger size, metal used, all of these variants, will determine the design. Once the design is finalized, a wax is then modeled by hand, filed and carved out. When the wax is done, we cast the piece in the metal chosen. Once the casting is done, we polish it and set the stone(s). Even though, I made it simple and described it in very few words, the process of creating a beautiful custom jewel is intense and laborious. Precision, exactness and patient is required to create that perfect, one-of-a-kind piece that will charm the eyes and withstand the passage of time.